Again, there’s a sense that the writing assignments on the first season of Voyager are a bit messed up. The Cloud sees Michael Piller working on a story idea from Brannon Braga. The two writers have dramatically different approaches to Star Trek. Piller is strongly interested in the characters at the heart of the story, while Braga is more fascinated by the weird pulpy high-concepts lurking around the edge of the genre. Their sensibilities do not mesh well. So this team-up is as weird as the writing assignments for Parallax and Time and Again, where Braga got the character-driven status quo establishing script while Piller worked on the wacky time travel adventure. The Cloud is essentially a Brannon Braga story. It’s one of those “strange phenomenon of the week” stories, where Voyager stumbles across something weird in outer space and decides to investigate. In this case, the strange phenomenon is a giant space-faring life form. On the other hand, The Cloud is also very clearly a Michael Piller script. It’s populated with little character moments and exchanges, some nice interactions and relationships. Indeed, The Cloud does quite a lot to develop the ensemble – realising that none of the characters other than Janeway, Paris and Torres have really had a chance to shine yet. It’s character-focused in the way that Piller scripts tend to be character-focused. In fact, it’s similar in tone to Piller’s work on the third season of The Next Generation – developing the characters we know further, and finding voices for the characters we don’t. However, it’s quite clear that The Cloud is really the result of two different approaches to Star Trek that don’t blend smoothly. The script’s structure is all over the place. Voyager wanders into the eponymous cloud. It wanders out. Ten minutes of character development unfolds. Voyager then decides to wander back into the eponymous cloud. The Cloud feels almost happy-go-lucky as it tells its story. There’s no urgency to anything that unfolds, and the script can’t seem to decide whether the anomaly of the week or the character development deserves the show’s focus. It is messy, but it’s messy in the right sort of ways. This isn’t Voyager on auto-pilot. This is Michael Piller trying to figure out how to write for these characters and actors. It’s a necessary part of a show’s first season, something that Voyager has been forestalling by coasting on the formula established by its predecessors. That’s certainly an understandable urge. After all, UPN very much wants a show that is exactly like The Next Generation, and ideally as successful. It’s worth noting that this is not a problem unique to Star Trek: Voyager. Even Star Trek: Deep Space Nine had its “let’s bring in Next Generation plots and guest stars” phase in its first season, and Star Trek: The Next Generation started trying to be the fourth season of the original Star Trek. Star Trek: Enterprise spent its first two seasons as a copy of a copy, the fifteenth and sixteenth seasons of The Next Generation. The only difference is that the other shows outgrew that phase in a way Voyager never quite did. Okay, let’s ignore the fact that this implicitly suggests that the crew have transition through the various stages of grief that lead up to “acceptance”, because they certainly haven’t done so on screen. (Unless “exploring” is a new phase on that particular scale.) The Cloud begins by assuring viewers that the ship’s predicament hasn’t been forgotten and that our character will be dealing with it in some way. It’s a nice touch, and something the first season could do a bit more. And a lot of The Cloud is dedicated to getting us to know the various characters living and working on Voyager. In Captains’ Logs Supplemental – The Unauthorized Guide to the New Trek Voyages, Brannon Braga suggested that Piller’s work here was influenced by his affection for Pulp Fiction. While it seems like a bit of a generalisation, in that pretty much every script with casual conversation written in the nineties tended to invite the comparison, it makes sense of some of the looser interactions here. In particular, Paris and Kim’s conversations about proper mess hall etiquette (“captains don’t want courtesy, they want respect – that’s why they don’t get chummy with the lower ranks”) and the tangent about how good Harry’s memory is (“I remember being in my mother’s womb”) feel vaguely Tarantino-esque, as our characters talk about things that characters on Star Trek don’t generally talk about. There’s a wry sense of humour to Piller’s script, as if he’s acutely aware of the stock criticisms that would be thrown against Voyager in the years ahead. Both Neelix and the Doctor pause to acknowledge how silly the episode’s central plot is for a ship that really should be trying to get home. “This ship is the match of any vessel within a hundred light years, and what do they do with it?” Neelix asks rhetorically. “Well, let’s see if we can’t find some space anomaly today that might rip it apart!” He seems to have foreseen the next few years of plotting on the show. The Doctor is similarly frustrated to discover the ship has wandered into a nebula. “A nebula?” he wonders. “What were we doing in a nebula? No, wait, don’t tell me. We were investigating. That’s all we do around here. Why pretend we’re going home at all? All we’re going to do is investigate every cubic millimetre of this quadrant, aren’t we?” Piller seems wryly aware of how this seems an absurd way of developing Voyager‘s core concept – trying to do a continuation of The Next Generation, despite the fact that this is a different so. In fact, there’s a sense that Piller is having a bit of fun at the episode’s central premise, treating as something of a Star Trek cliché. The Cloud seems curiously uninterested in its anomaly of the week, and the whole thing is treated as a set-up for various character-based jokes. 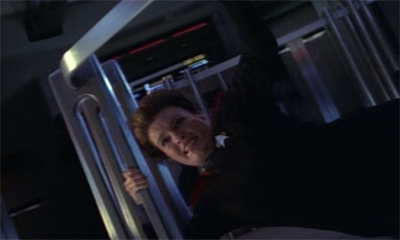 It’s Janeway’s monomaniacal desire for coffee that risks dooming the ship. (In fact “there’s coffee in that nebula” feels like a playful riff on the Western cliché “there’s gold in them there hills.”) Janeway mutes the Doctor when he gets too sanctimonious. Neelix serves finger food in the middle of a crisis. Piller is less interested in the eponymous life form than he is in the excuse to create a place where the Voyager crew can hang out together. The tavern is very clearly intended as a spiritual successor to the poker game on The Next Generation, a place where the crew can relax and banter with one another. Of course, Voyager has to be a bit more ostentatious. 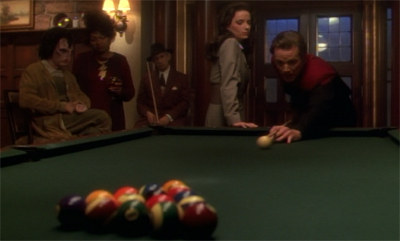 The Next Generation got a poker table in the middle of a standing set, so Voyager has to build its own new standing set. That said, not all of the character work here is good. As nice as it is to see Tom and Harry hanging out together, two of the show’s problem character become obvious here. To be fair, Neelix had seemed potentially troublesome since Phage, where his possessive and creepy relationship was pushed to the fore. However, The Cloud compounds this characterisation; far from being awkward comic relief that doesn’t work, Neelix is a deeply unpleasant individual. Neelix seems like a creepy two-faced manipulator, which is at odds with how the show wants to present him. 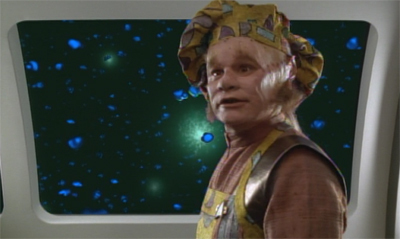 Neelix is generally treated as the happy-go-lucky comic relief on Voyager. He’s generally meant to be charming and endearing, if a little over-eager and excitable. However, little moments like that – along with his general attitude towards Kes – make Neelix seem like a horrible person. The fact that the show is unaware of this – and seems to remain unaware of this throughout its run – is a little unsettling. And then there’s Chakotay. Chakotay was probably always going to be a problematic character. He’s the first Native American lead character on a Star Trek show. However, he is portrayed by a Mexican American actor Robert Beltran, which seems like an awkward choice, particularly since the franchise had a history of casting Native American actors for major Native American roles in episodes like Journey’s End. However, the casting of Chakotay is perhaps one of the character’s least problematic aspects. To be fair, Chakotay is quite fine on the surface. He’s a functioning member of the crew. 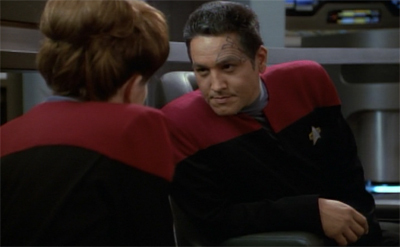 He’s good at his job, even if we seldom get any real sense of who Chakotay is as a person. He is proud of his Native American heritage, but the show doesn’t always feel the need to pander. Unlike portrayals of Native Americans in Star Trek: The Motion Picture or Star Trek: The Animated Series, Chakotay still wears the standard uniform and has his hair cut to regulation length. The homogenised “Indianness” of Chakotay’s character also tells us other things about the future history of Native Americans. 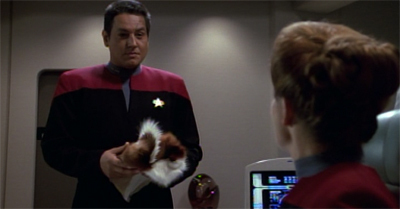 Chakotay observes a mismatched assortment of practices. 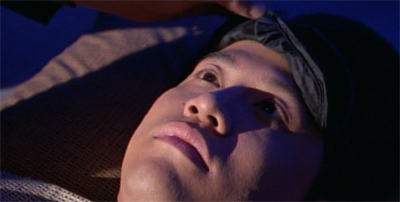 Although Tattoo suggests a Mesoamerican lineage for Chakotay’s people, the first-season episode The Cloud shows him using a medicine bundle to summon a spirit guide and using a word from the Lakota language to describe the creature, both of which indicate a Great Plains origin, not a Mesoamerican one. More to the point, he shares his rituals – handling the medicine bundle, using a medicine wheel, and undertaking a vision quest, for instance – with his shipmates. 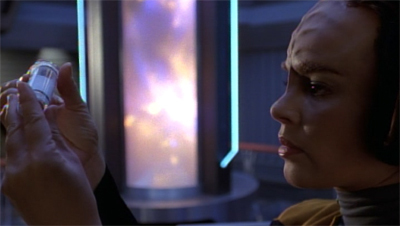 Without being educated or prepared for sacred (and often very private and personal) ceremonies, these other characters use Chakotay’s spiritual practices as they might use a tricorder: as a tool to be picked up, used, and then put down once again, rather than as a lifestyle or faith requiring commitment and conviction. As one First Nations viewer puts it, in the future, “Everybody can be Indian!” For that matter, any Indian can be every Indian. This certainly feels like a fair criticism. Chakotay has one casual conversation with Janeway about his beliefs and is ready to walk her through a sacred religious rite. Indeed, it’s also quite clear that he has gone through the same rite with Torres, as well. 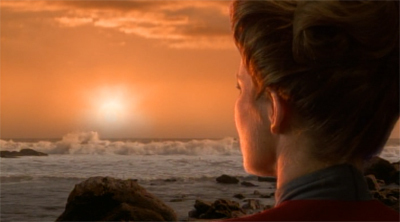 Chakotay’s spirituality doesn’t feel fully-formed or deeply personal. Instead, it seems more like a party trick he uses to casually entertain colleagues. Within the context of the four Star Trek series, Chakotay is the first human character shown to have religious faith. In earlier series, characters such as Spock, Worf, and Kira – characters with distinct spiritual beliefs and practices – were always non-human, alien, and distinctly Other. Insofar as Chakotay is human, his religious faith is more mainstream and approachable than that of Spock, Worf, or Kira. At the same time, insofar as Chakotay is Native American, his religious faith is marginal, exotic, and also distinctly Other. As historian Daniel Francis has noted, “non-Natives in North America have long defined themselves in relation to the Other in the form of the Indian.” Furthermore, as an intentionally generic Native American, the character of Chakotay is an “imaginary Indian”, a white, European representation of what it means to be Native. Unfortunately, The Cloud isn’t even the worst of it. It’s just the first time that Chakotay’s heritage has been pushed to the fore. 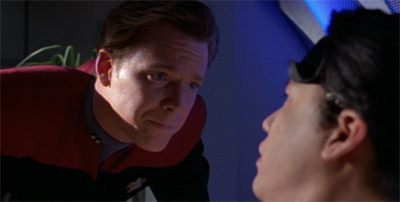 Caretaker had been a bit playful in its invocation of Chakotay’s heritage – Tom Paris makes a variety of racist remarks that Chakotay plays along with, demonstrating a wry sense of humour that would be downplayed in the seasons ahead. To be fair to the producers of Voyager, they did make an effort. Given that Voyager is working so hard to recapture that “space as the wild west” vibe that defined the original Star Trek, featuring a Native American character in a position of authority could be an effective way to counteract the problematic aspects that come with that territory. It might serve as a demonstration of how far the franchise has come, acknowledging that episodes like The Paradise Syndrome were way out of line. A Vision of the Future reveals that the show’s creators worked with an “expert” in Native American culture and heritage to help ground Chakotay as a character. Unfortunately, that expert was Jamake Highwater, a controversial figure with a shady history whose claims to be Native American have been challenged since the 1980s. So, somewhat sadly, this is the shape of things yet to come. It’s worrying that the show thought it could pull off the sort of generic mysticism that it does here, but it’s more unsettling that – after the episode aired – the show decided to continue down that path in later episodes. Still, it’s early days. The Cloud is a first season episode doing what first season episodes should be doing. It’s experimenting, and trying to develop its ensemble. Sure, it stumbles along the way and makes any number of missteps, but it is still more adventurous than something like Time and Again or Eye of the Needle. It’s not the strongest episode of Voyager‘s first season, but it’s doing thing that need to be done in the first season of any successful young show. They aren’t immediately successful and they don’t immediately pay off, but they pay dividends down the line. Unfortunately, The Cloud is not an episode that can work in isolation. It’s a tentative first step down the road that will allow Voyager to define its own identity, distinct from its predecessor. It’s not a confident stride, and it occasionally feels like an awkward stumble. However, taken on its own, it’s relatively meaningless. The show needs the confidence to commit to this sort of path – to keep developing its characters, to keep playing with the idea of a crew far from home. If the show is to distinguish itself, it needs to be willing to play with the characters and figure out what works and what doesn’t. 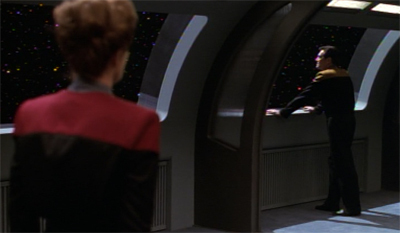 It took Deep Space Nine three years to make Julian Bashir work, but it was worth the effort. It’s tough going at the start, awkward and troublesome, but it might just be worth it in the end. You could end up with a show that has its own voice and cast and mood, one that stands apart from the crowd. Or it could just retread The Next Generation. That’s easier to do and involves a lot less early stumbling. I Love Star Trek& Lost in Space. They haven’t got Neelix’s character right yet, which I don’t think happens until Season 2. Was Chakotay from Dorvan V? That’s an idea that’s been banded around by Star Trek fans and suggests why he joined the Maquis. It’s not clear where exactly Chakotay’s from. I believe it was intended at one stage that he would be, and it makes sense. It is also possible that the entire region was colonised by Native American settlers and he could be from a neighbouring world. 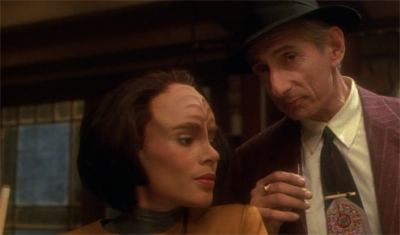 The Doctor talks about creating a family with B’Elanna in Sickbay and he later does just that in Real Life. It’s nice to see some early ideas on Voyager followed up on, even if the execution was totally lame. I had not noticed that. Good spot!